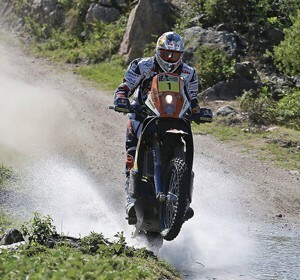 Red Bull rider Cyril Despres put in a magnificent ride in Monday’s Stage Nine of the Dakar 2013 when it resumed for the second half of this year’s edition. 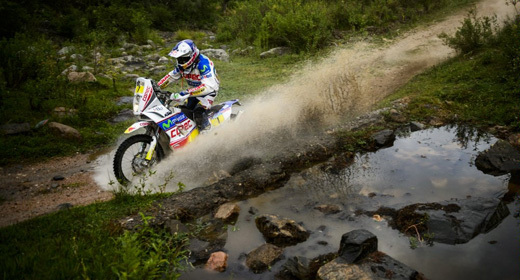 The title-holder won the stage and moved into second overall while his factory teammate Ruben Faria of Portugal took control of the overall lead. Despres, a multiple winner on KTM machines went out on what was the longest stage of the rally knowing it was time to make an impression. He put his mixed fortunes of previous days behind him and finished the stage in five hours 41.36, three minutes 21 ahead of Joan Barreda of Spain. With Faria in the lead, Despres now has a fighting chance of defending his title with a deficit of just 5 minutes 23 and many kilometers to go before the finish in Santiago, Chile on January 19. The French rider had a magnificent day out on what was certainly one of the most grueling stages of the rally this year. He left the starting line in the early hours of the morning lying in fifth place overall with a deficit of around 25 minutes, including a penalty of 15 minutes for having changed an engine. That he was able to cut that to just five minutes was a testament to the immense skill and fighting spirit skill of KTM’s four times Dakar winner. Despres went on the attack as soon as he hit the track and fought hard all the way to claim his thirty-first career stage victory. 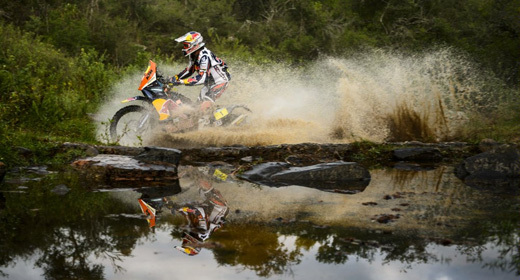 KTM rider Chaleco Lopez of Chile, currently third overall managed to finish in tenth place in the stage after a fall cost him valuable time. He is nine minutes 03 adrift from the leader Faria making it a three-way KTM lead at this stage. KTM factory rider Joan Pedrero of Spain finished eighth in the stage, Factory B Team rider Kuba Przygonski of Poland was thirteenth and American Kurt Caselli finished fifteenth, trailing the leader by 25 minutes 37. Caselli who was drafted in to ride for the injured Marc Coma is having a great first ever Dakar but he did pick up a swathe of penalties for missing a checkpoint and several waypoints in Stage eight. KTM Factory Team boss Alex Doringer underlined that Caselli is “here to learn” and said he was doing a great job. Meanwhile, KTM Motorsports and the KTM Factory team wishes to extend condolences to the Yamaha Team on the unexpected death in a road accident in France of the legendary Jean Claude Olivier, former manager of the Yamaha France Dakar Team. Speaking from Austria, KTM’s special advisor and former double MX World Champion and Dakar rider Heinz Kinigadner said Olivier was a big man with a big presence who was very instrumental in making the Dakar Rally what it is today. “Jean-Claude was still competing when I was racing and he had a big influence in shaping how the Dakar Rally has developed,” he said. “JCO” as he was known competed in the first ever Dakar Rally in 1979 and had his best finish in 1985 when he finished second. He was 67 years old at the time of his death. An unequalled Despres, an unstoppable Peterhansel and an unfortunate Nasser!